Are wine ratings bought? Is the wine business bought? There has been a whole lot of hoopla in the wine world over The Wine Advocate’s, Jay Miller stepping down and Robert Parker turning the reigns in California to Antonio Galloni. One blogger wrote a very basic post wondering what to expect from Antonio’s visit to Sonoma? What seemed to be a blog post of little importance actually touched a nerve in many on the wine world. Looking at the comments posted, you will see all the HOOPLA! Everyone has an opinion on the subject. The question posted was, will Antonio Galloni only taste the wines from the Sonoma County Vintners Associations members or will he be trying other non-member wines. The blogger’s implication was that the Wine Advocate is bought by the SCVA. The SCVA is the sole entity responsible for choosing what Antonio will taste, meaning only the wines of its members thus alienating 600+ Sonoma wineries. Is that fair for such an influential publication to put scores out for Sonoma and only rate wineries that belong to the SCVA? Perhaps the SCVA is also bought. The SCVA and other vintner associations such as Napa Vintners Association ask wineries to pay dues in order to get their wines in front of publications, buyers and affluent wine people. The associations were created to give exposure to the regions they represent. Getting exposure cost money. The associations need to pay for advertising, product placement and special events that will ultimately benefit its members. Wineries can choose to join, or be on their own. The $1,000 membership fees might be nominal for one winery, but costly for another. So it turns out, that those that pay get to play. Another blogger reported that after 2002, the Wine Advocate increased it’s number of wines rated 90 points or higher by 70%. What is the reason for this? 3) The Wine Advocate saw it more profitable to list more 90 point wines and helped fill its pages. I don’t think that there is a simple answer. What I see being the issue is the question this blogger posed, are wine ratings bought? Of course they are, and so is the Wine Spectator and every wine buyer out there. This is nothing new. Money buys exposure. The Vintners associations are created to give wineries more exposure… they are BOUGHT! The Wine Spectator sells advertising on its pages so that wineries have more exposure…it is BOUGHT! The Wine Advocate rates wines and in the process is wine and dined by the wineries…it is BOUGHT! Wine buyers at all restaurants and retail shops are sent free samples, offered stays at wineries and flown to regions throughout the world. All for the exposure for those wines…we are BOUGHT! Wine is no different from any other business, so lets tell it like it is…it is a bought industry. The other bloggers will go back and forth and argue this point, but one really can’t. The truth is staring everyone in the eyes, we are Capitalists and the only way the system seems to perpetuate itself is by doing business as usual, paying for product placement. Whether that product is placed on Top Chef, on the cover of the Wine Spectator, the desk of Antonio Galloni or in the hands of the wine buyer at a restaurant or retail shop, it is bought. Now will this ever change, I don’t think so. The system is what it is and always will be. The problem is that the consumer seems to be the one that suffers. The current Wine Advocate’s rating system is based on one person’s palate. The average wine consumer does not understand this, they buy according to scores. They are oblivious to the fact that at the time the wine was rated, many other wines were left out. The wines were rated with an unscientific approach, without a control group. The taster end up comparing apples with apples and not including the oranges. The wine taster, in this case Antonio, likes a certain style of wine. The score is subjective and is based on the style of wine Antonio likes. So as a consumer, one goes to buy a wine and uses Antonio’s rating to make a decision. How does the consumer loose? First, the selection is cut in half since Antonio does not rate all the wines, the consumer misses out on other wines that may not be part of the vintners association for that region. Secondly, the high score will only be given to a select style of wine, one that pleases Antonio’s palate. Some consumers might like his palate and adhere to his scores. Others, or should I say the majority, only buy because of the score and don’t know what the wine should or shouldn’t be like. They end up basing their understanding of what makes a good wine by what Antonio likes. I believe that our job as sommeliers and wine educators is to expose the wine industry and help the consumer understand wine. Wine ratings are a valuable way of keeping wineries honest and giving the consumer a somewhat understanding of what a wine is like. I believe that ratings should be done by individuals that do not receive profit from their ratings. A rating panel composed of sommeliers, wine writers, wine shop owners, wine makers and wine educators. 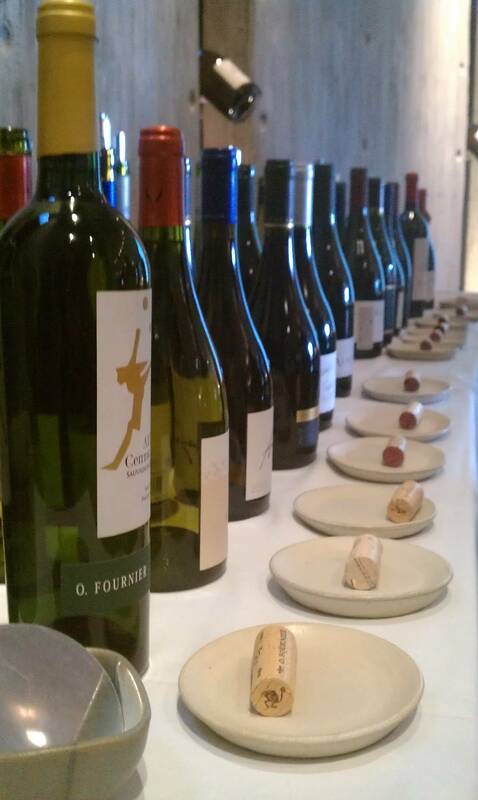 The tastings should be blind and based on how true the wine is to varietal character, the region and price point. The scores should be compiled and averaged out between all tasters. This way we get a more accurate score that at least offers different palates and different perspectives of wine. The ratings should be published by a free publication and free for other publications to use. Of course we will run into the issue of which wines to rate and how can one group rate so many wines. I don’t have an answer for that, but at least we have a start for a balanced tasting panel and a more accurate approach to rating wines. Now will this ever happen? Probably not, but at least I can voice my opinion. I believe that part of my job is to make wine more accessible and understandable to the consumer, hence my blog. So I will continue to pursue educating the general public and hopefully create a more confident and competent consumer. I posed this question to my servers at the restaurant and I can’t wait to hear their thoughts. If anyone truly thinks that Galloni likes Saxum, Aubreu, Harlan, Kongsgaard, SQN, etc. they need their head examined. He drinks Champagne in his free time and grew up in love with Barolo. He not only likes but he L-O-V-E-S high acid (make that SUPER high acid), tannin, grip, structure, and low Ph. 1) Waiting to change the direction of the Advocate slowly. 2) He is waiting until he owns the Advocate 100% to make again a slow change in the direction of the publication away from bomb style wines. Thanks Derek, we can only wait to see what the results will be. I am hopeful that Antonio will shake things up a bit. Regardless, business is business, and I don’t see any great change happening any time soon. Absolutely! Why do we need someone to tell us what we need to like. Get to know what you like and buy it. Cheers!